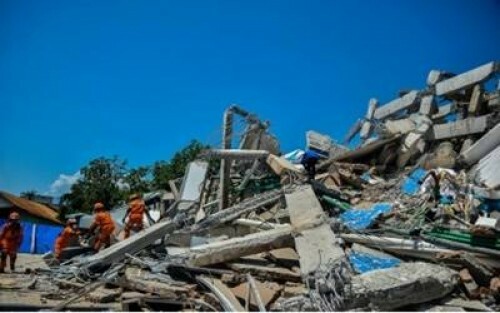 Jakarta, Oct 11 Indonesian authorities on Thursday extended the deadline for the search and rescue operations for a possible 5,000 people missing in the areas worst affected by the earthquake and tsunami which struck Sulawesi island on September 28, killing 2,073 persons. The National Agency for Disaster Management (BNPB) said that the operations have been extended at the request of members of the communities affected by the disaster, reports Efe news. BNPB spokesperson Sutopo Purwo Nugroho said in a press conference that search activities for possible survivors will officially end on Friday, a day later than planned. After Friday, a 15-member team will be on call in case there is a request to rescue victims, Yusuf Latif, the spokesperson for the National Search and Rescue Agency in the city of Palu, told Efe. Rescue workers have not found any survivors for more than a week and authorities announced that the most devastated areas will be converted into green zones and parks in memory of the victims. Central Sulawesi Governor Longki Djanggola told reporters that the disaster relief period will continue until Oct. 26 in order to rebuild infrastructure and help the more than 82,000 people displaced in the catastrophe. According to the latest data, the official death toll stood at 2,073 while 2,549 people have been seriously injured and 680 remain missing. Most of the deaths took place in Palu, capital of Central Sulawesi province and the city worst affected by the disaster. Local village chiefs have said that around 5,000 people could be missing in the Balaroa neighbourhood in Palu and the Petobo suburb. Both areas suffered soil liquefaction, a phenomenon which occurs when a strong earthquake strikes an area with saturated loose soil, making it sink and producing large amounts of mud. More than half of the victims have been buried in mass graves to prevent the spread of diseases. Sutopo said on Wednesday that the tsunami waves reached a maximum height of 37 feet, and a minimum of 2.2 metres in coastal areas of Donggala, adding that seawater reached up to 468 metres inland. The Sulawesi quake and tsunami were the worst natural disaster to have struck the country since the 2004 tsunami that hit Aceh, in the west of the archipelago, leaving 167,000 people dead.